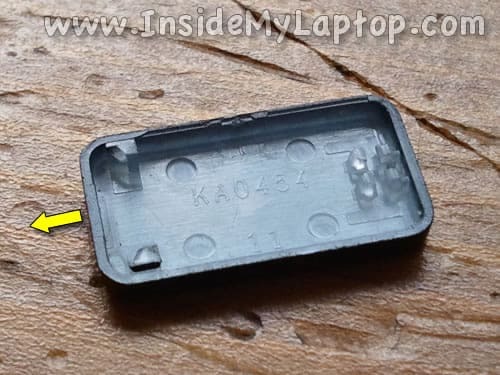 By the way, in one of the following posts I will show how to replace the entire keyboard on a MacBook Pro 13″, 15″, 17″ unibody. 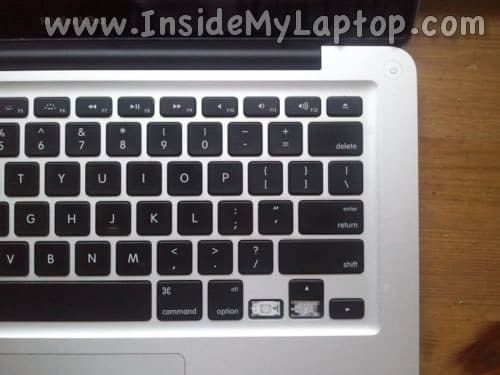 As you see, I have two damaged keys on the MacBook Pro keyboard. 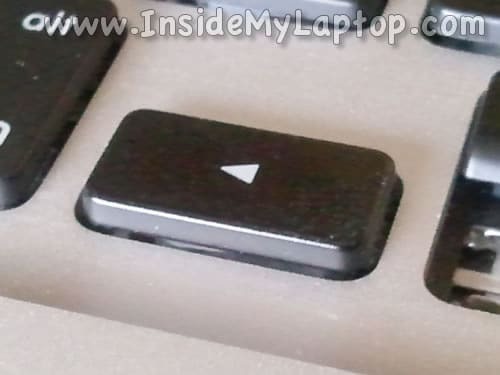 The left arrow key missing just the cap. 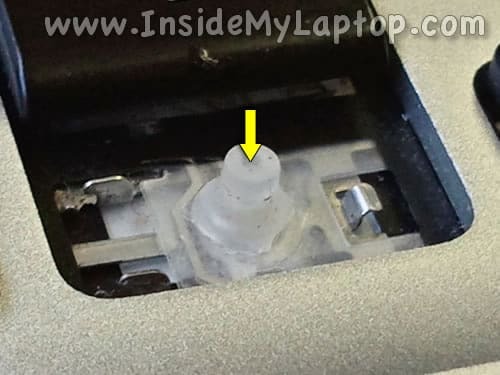 The bottom arrow key missing the cap, key retainer (hinge) and silicone plunger. You will need needle nose tweezers to handle small parts. 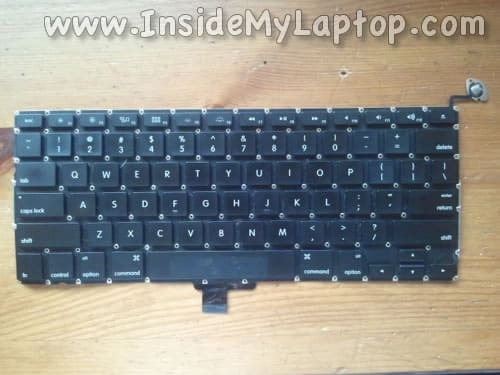 Remove the key cap from the damaged (donor) keyboard. 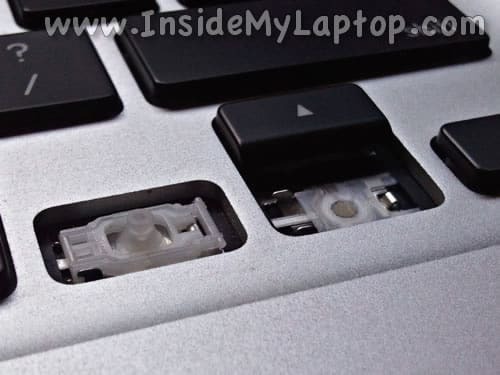 In order to do that insert a sharp object between the key cap and key retainer and lift it up. The key will unsnap from the retainer. 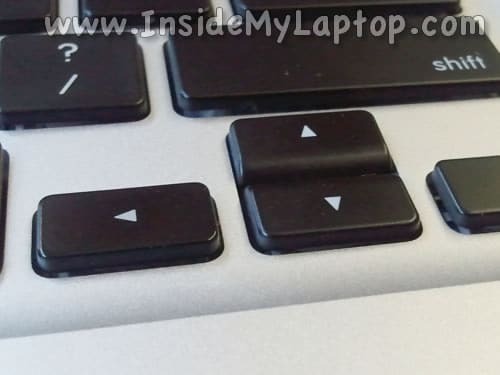 The left arrow key cap removed. Turn the key cap over and inspect small plastic key holders on the bottom side of the key. Make sure they are not damaged. These holders secure the key cap to the retainer (hinge). 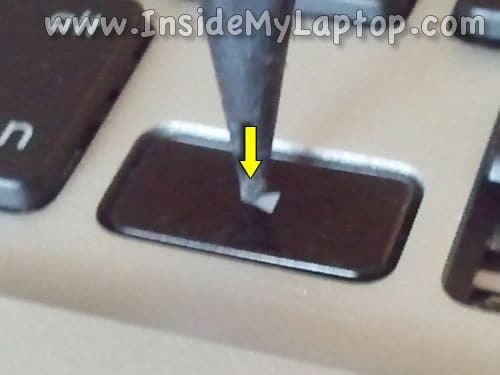 When you install the key cap on the retainer, make sure to seat the side with holders on the edges of the key fist. In my case the left side of the key cap should be seated properly. Seat the side with holders on the edges of the key fist. Make sure the holders engage with the retainer. Push on the button until it snaps on the retainer. The left arrow key has been repaired. Make sure it moves freely. Now let’s fix the bottom arrow key. Remove the bottom key from the donor keyboard. Inspect the bottom side of the key, make sure that holders are not damaged. Carefully remove the key retainer from the donor keyboard. Inspect the retainer. Make sure it’s not damaged. Very carefully separate the silicone plunger from the donor keyboard. 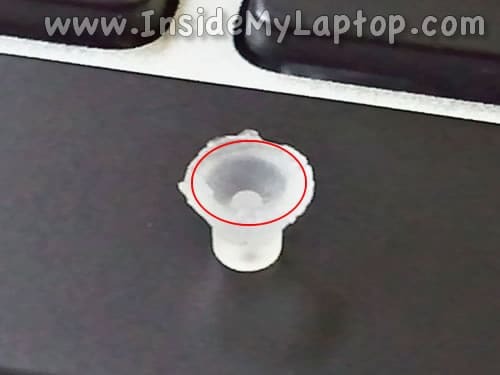 Try to remove it from the keyboard as clean as possible, so the bottom side of the plunger remains as flat as possible. You can use a very small knife to separate the plunger from the keyboard. On my target MacBook Pro one of the metal hooks was bent so I corrected the problem. Turn the silicon plunger upside down. Apply a small amount of super glue on the plunger edges. You need the glue just on the edges. The first time I wasn’t careful enough and the glue filled up the plunger. I had to use another one. Seat the plunger in the right position on the target keyboard and let the glue dry. At first, I tried applying some pressure on the plunger but it didn’t work, because the plunger just kept moving around. Finally, I just reapplied the glue and let the plunger to seat by itself for about 10 minutes without applying any pressure on it. 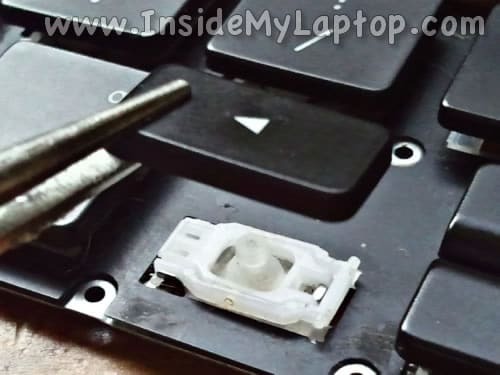 Install the key retainer on the target keyboard. Install the bottom arrow key as we did in steps 3-5. Make sure the key moves freely. The keyboard has been fixed! Truly an effort .I damaged my keyboard and i consulted vender he directly asked me to replace it completely instead of telling me about the single key replacement and he asked too much price for that . you have truly saved me , I was already having a spare keyboard and i did it my self after checking these steps mentioned. Thanks a lot to you and keep writing. 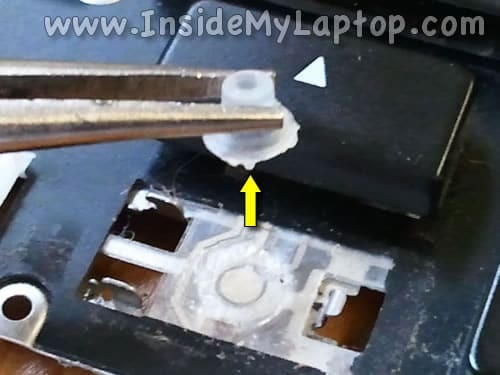 You can cut a new plunger with it’s surrounding plastic from a parts keyboard and it usually will sit fine without any glue needed. Just FYI. Ask the ebay seller for that if the parts are from there. Does anyone know how to fix the bad circuitry, not the mechanical key itself? I heard it could be done but I’m skeptical myself. I may try to do this in a month or two and report back if successful. Check out this post. You’ll find locations for power on pads for many different motherboard models. I looked on eBay for a second hand laptop and they are going for over $800! YIKERS! Anyone want to sell a key and the plunger to me for the going rate? I’m none too optimistic that this is going to work. 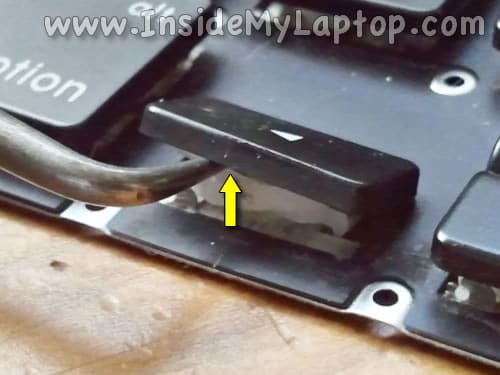 I think I severed the wires that connect the key to the laptop :-(. It worked for a while, but sadly, no longer. Has this worked for anyone who has had one of their keys stopped working completely for no reason? My older computers NEVER had this problem, ever, only the newer ones. Cheaply made I’m assuming. I hate to throw this away. It’s ONE key, but it’s important. I’ll donate if it works :-). Frantz Figaro, wanna sell me a key and a plunger? I’ll donate if it works. THANK YOU for the suggestion (Macbook Pro). If one key stopped working for no reason probably this is keyboard related failure. In this case you have to replace the keyboard. You cannot fix jut one key. DUDE, YOU SAVED MY LIFE FOR THIS!!! I followed your instructions because one of the keys were popped off!!! 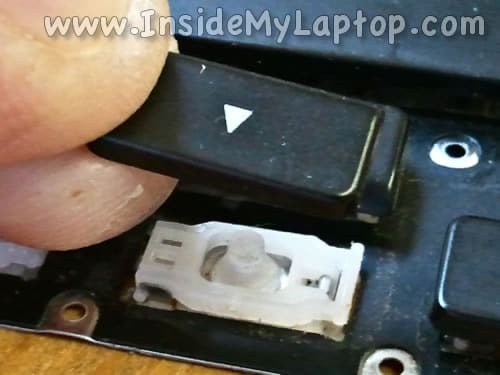 I’m also typing this on my dads’ computer so this tutorial saved money and life! Hi lifesaver , i have a problem on my Macbook regarding the key “7”. When i press once, it does not appear in th screen. And the next thing is when i press and hold, it came out 1 to 5.Can u guide me in solving this problem? Thank you. Probably you’ll have to replace the keyboard. I have a guide for that on this site. Thank you very much. I spent two and a half hours at the service center only to be told that this fix shall cost me Rs 14000/- (approx $ 230). Your post helped me fix it it 03 mins. Thanks to you and the inventor of the safety pin. Thank you! Somehow one of my keys came off but your guide helped me work it out! I just fixed a broken key, and I’d like to share how I did it without removing the plunger thing! Problem: The key was working inconsistently; sometimes it typed, sometimes it didn’t. 1. 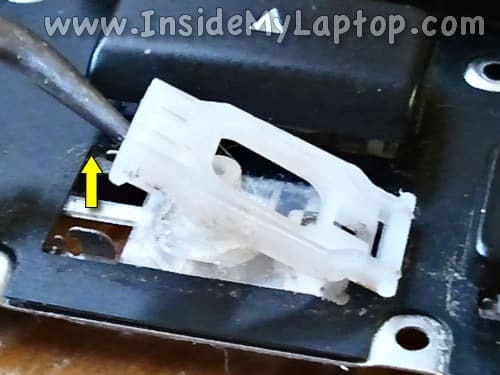 Remove key and retainer as shown. 2. Using a tool, very slowly but firmly pull up the hook upwards to make the key more sensitive again. SLOWLY! YOU DO NOT WANT TO BREAK OR DETACH IT! 3. Reattach the retainer and key. Test to see if the key works properly. If it doesn’t, just pull on the hook a bit more until it works consistently. Good luck, guys! Hope this helps you! Great site. The photos are outstanding. I’m looking for a “how-to” book on servicing a MacBook because I live two hours from the nearest Mac fix-it place. Simple upgrading things like adding memory, replacing HD’s, fans, etc. I’m not a techno-nerd but I’m an innovator and good with small fiddly stuff such as making gun parts when I have to. Any recommended instruction books? Umm, excuse me, but have you got any idea on how to fix slightly unresponsive keys? I’m a fan fiction writer, you see, and my e key is completely broken (I use copy and paste to paste it in), and my r and w keys are becoming increasingly unresponsive. I now have to forcefully push my w key until it makes several clicking sounds, and then it starts to work slightly. 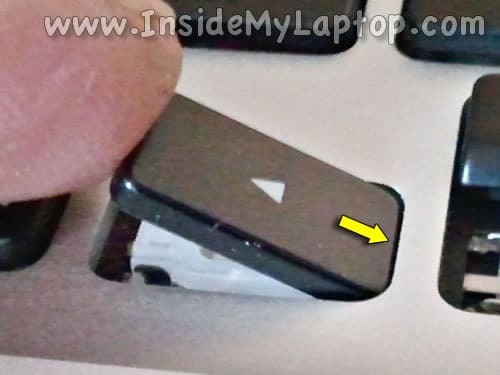 When I do push it in from the edges, it makes the clicking sound like I mentioned before. Is this a broken hook? I was removing my command key to replace it and now it acts like it is always being pressed – even before putting the new key in. Is there anything I can do to fix this? 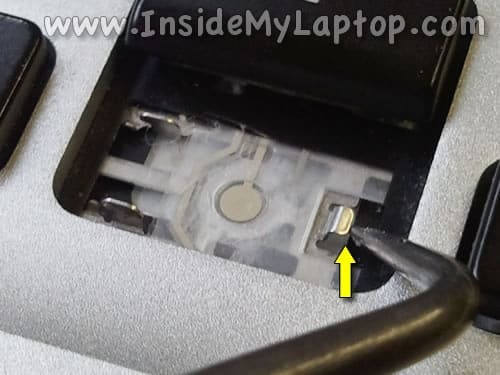 I have a problem recently with few keys of my MacBook Pro 15′ Mid-2010. I live in a boat. I remember it falling inside the boat after a big wave, and I can’t remember water falling on it. Anyway, recently, I realized that few keys (although they are not actually broken like the ones you repaired in this post) don’t work… They are all in the same area… P, M, Enter, -/_, 0 etc. It looks like humidity to me… doesn’t it? Could you tell me if there is a way (dry spray, contact cleaning product etc.) to clean them without having to change the whole keyboard? 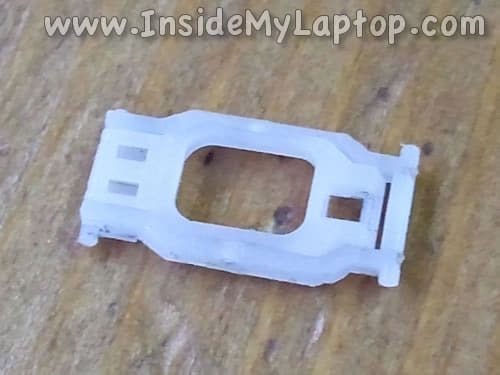 One of my mac book pro key got poked out by my son, I took it to apple shop and they told me the spring under the key was broken, they can only replace the whole keyborad which gonna cost me A$3xx, am I still able to replace the key like that, I can’t type question mark now (the broken key) and I really don’t want to spend money to replace the whole key just because there is one broken key, your advice will be greatly appreciated. is there a simple way to rectify this? Thanks! This saved the day for me when the dog remove a few keys from my MacBook Pro.